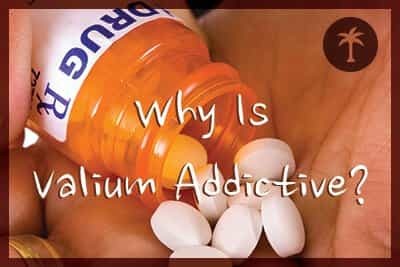 Resource center Valium Addiction and the Rehab Process Why Is Valium Addictive? How Can Doctor-Prescribed Valium Lead to an Addiction? Valium is the brand name for a popular benzodiazepine, diazepam. The drug was approved in 1963 by the Food and Drug Administration (FDA), and the generic version was approved in 1985. Like other benzodiazepine medications, Valium is prescribed to treat anxiety, panic disorders, obsessive-compulsive disorder (OCD), and seizure disorders like epilepsy. Occasionally, Valium is used to manage withdrawal symptoms associated with long-term alcohol abuse. Benzodiazepines work on the same area of the brain – the gamma-aminobutyric acid (GABA) receptors – as alcohol, so medications like Valium can be used to taper the body off alcohol dependence. This reduces the risk of serious complications like delirium tremens. However, since Valium acts on the GABA receptors, like alcohol, abusing this drug can lead to a similar relaxing, intoxicating effects as alcohol, and it can become addictive, leading to chronic health problems. Warnings on the drug’s label are clear that benzodiazepine medications like Valium should not be taken for more than two weeks because they can lead to physical dependence very quickly. Valium is a widely prescribed drug, and when drugs are available through prescriptions, they are at risk of being diverted. The Substance Abuse and Mental Health Services Administration (SAMHSA) found that, between 2000 and 2010, the number of people who entered treatment to end Valium addiction, especially in connection with prescription painkillers like opioids, rose 570 percent. When this medication is taken as prescribed, it is digested and enters the bloodstream between one and two hours after it is consumed. Abusing the drug in other ways, like snorting or smoking it, may force the drug to cause intoxication faster. Although Valium has been a prescription medication for decades, it is still often used because it is a long-lasting medication, so peak effects last longer than with other benzodiazepines, such as Halcion or Xanax. Part of the reason intoxicating substances are addictive is because, through other brain processes, they stimulate the reward system and release a surge of dopamine, serotonin, and norepinephrine – important neurotransmitters that elevate mood and energy. Until recently, the method that benzodiazepines took to flood the brain with serotonin and dopamine was not well understood. However, in 2012, a group of medical researchers found that, through stimulating GABA, Valium prevents a group of neurons, called inhibitory interneurons, from halting dopamine production. When dopamine is allowed to be produced without restraint, this causes a surge of happiness, excitability, relaxation, and pleasure. While it was known that Valium acted similarly to alcohol, the exact method of intoxication wasn’t thoroughly researched. By binding to the GABA receptors and allowing the brain to produce dopamine, these drugs may stimulate a person’s brain so much that they go back for larger doses and eventually develop compulsive behaviors; this is addiction. Physical dependence on benzodiazepines also develops quickly. This is a psychological response for many people because Valium and related drugs are most often part of treating anxiety disorders. A person with anxiety or insomnia may begin to feel like they can’t function normally or avoid a panic attack unless they take Valium, even when they do not need it. It is important to work with a therapist to change behaviors, as a long-term method of managing anxiety, insomnia, or related mental conditions; taking a medication alone will not address a mental health problem and can lead to drug abuse. Although it is rare, it is possible to overdose on Valium. Benzodiazepine overdoses more often occur in combination with drugs that also cause sedation, like opioids and alcohol. However, overdoses on benzodiazepines like Valium do occur, so call 911 immediately if a person is found overdosing on these medications. Taking too much Valium can cause seizures; however, suddenly quitting without help can also lead to a seizure disorder. Other signs of severe withdrawal symptoms include fever, jaundice from liver failure, irregular heartbeat, and stopped breathing. It is very important to get help easing withdrawal with a physician’s oversight. Suddenly quitting the drug can be risky; it can cause rebound symptoms that are similar to the original condition, like anxiety. This can be very uncomfortable and lead to relapse to drug abuse, which increases the risk of overdose. A physician will gradually taper their patient off Valium, to ease them off the prescription when it is not needed or if the person has struggled with benzodiazepine addiction. One estimate suggests that 30-40 percent of patients taking benzodiazepines like Valium for more than a month are at risk of developing physical dependence on the drug. Because Valium lasts for a long time in the body, it is often prescribed to ease people off abuse of other benzodiazepine drugs as well as alcohol. It is possible to overcome abuse of Valium, provided an addiction specialist is there to help.